Mindflash Online Training Reviews Recently Reviewed! Comments: Even with the cons, I'd rate Mindflash a solid performer. You can quickly provide trainees a personalized dashboard. The content and user management interfaces are easy to use. The quiz options beat most of the platforms we've looked at. The platform provides basic LMS features at a very reasonable price. We've not had any showstoppers and our content library continues to grow. 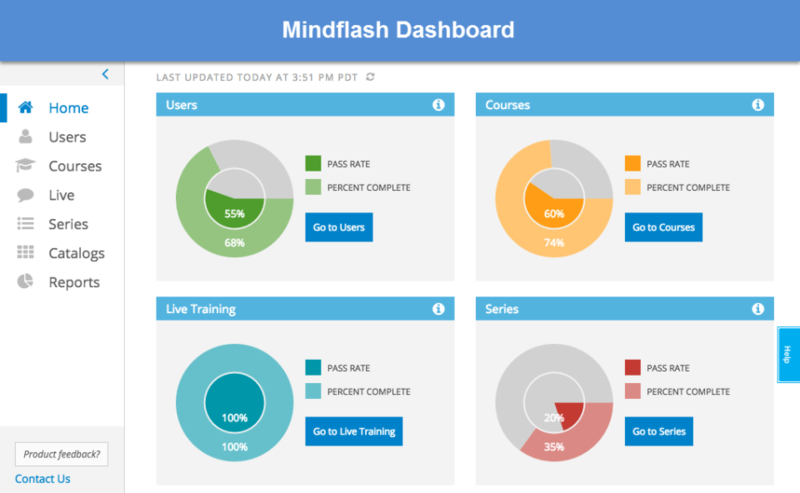 I'd recommend Mindflash as a solid but basic LMS for learners and administrators. Pros: Before I review this product, it's important to note that there is a new version of the product available. We're currently waiting in line to be converted. However, I don't think many of these items I'm about to mention will change for us. I'll mention it where it matters. 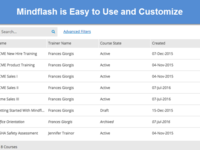 Mindflash is an easy to use LMS. We brought up a partner training program within a few months. It's a snap to bring up a trainee dashboard. Just add a little custom text, upload a graphic, and your good to go. The testing features are very good; true/false, multiple choice, multiple correct, label picture areas, label matching, and ordering of steps. The testing features will be even better in the new release. You can easily upload most content types and rearrange the sequence as needed. You can record audio right in the platform. There is reasonable Salesforce integration capability so, invitations and basic reporting can be done right in Salesforce. Administrators can easily flip back and forth between the admin and trainee views. The platform supports courses, series, and catalogs. There is a good set of options when building filters for viewing users or content. You can easily copy and modify course profiles and content. The in-platform reporting in our version of the LMS is abysmal. However, from what I've seen in the new version, reporting has some very big improvements. Cons: Mindflash is best for large enterprises where you can take advantage of higher level subscription plans that have all the features. Since they segment their levels by feature (and not number of seats), we're missing what I would consider to be basic functionality. We are currently on a legacy plan named Advanced. We can't modify existing text in invite and reminder emails, we can only add text. We can't remove the large Mindflash logo from the emails. We can't customize the certificates for completion of courses and the quality of the existing certificate options is poor. If you need to automate the reminder emails, there is only three interval options, three days, seven days, and fourteen days (you pick one). While it's easy to launch a trainee dashboard, the layout is not what I'd call a rich UI experience. It's basic. The mobile options are limited. This is an app for tablets but nothing for phones. You can't provide a fully public link to a course. The trainee must set up an account to view the content. If you use the public course feature, the system will not synchronize with the Salesforce objects for that trainee. To force the synchronization, you must send an invite to the trainee from Salesforce after they have already started or taken the course, which can cause confusion. Comments: Annually Sierra Service Project trains over 200 adult volunteers and 45 young adult staff members through Mindflash. We use Mindflash for two months a year intensively. Pros: Very easy to upload videos, PDF and Power Point files. Very easy to rearrange content, add quizzes, surveys and course/series requirements. Cons: No spell check in quiz sections. Content can be slow to load for users with not excellent internet connection. Wish there was a better method for keeping an account instead of deleting and recreating each year without paying a monthly rate. Ability to make account "inactive" but not accessible for in between time. Recommendations to other buyers: We used eLeap for one year to train our folks and we quickly went back to Mindflash (there was a year where they were rebuilding in 2011 I believe). We have been a customer since 2010 and have been very happy with response time, ease of use and updates throughout the years. 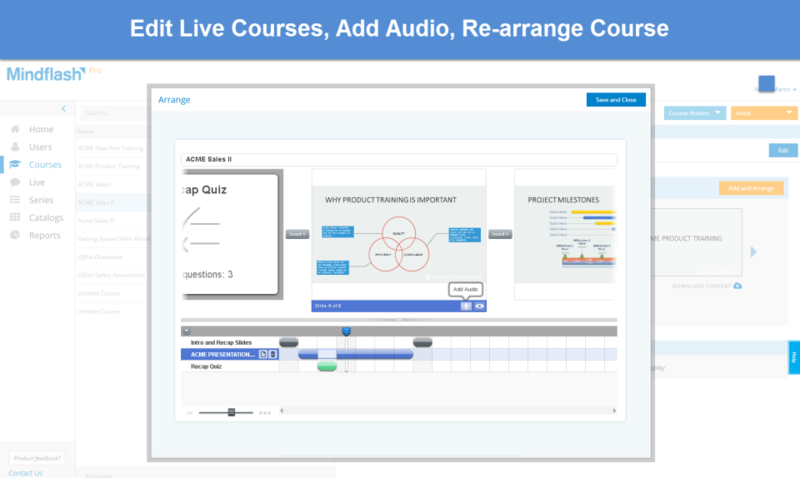 Pros: I like Mindflash's tools that help enhance my existing training content making it more attractive and vibrant. Navigation makes managing my content easy. Report and managing users helps my company stay on top of our trained users. Salesforce integration allows me to introduce tasks and tracking customer activity. Cons: Salesforce integration, being new to Mindflash, was a challenge. But the programmers response and effort help make the integration work helped us utilize the full benefits of using Salesforce with Mindflash. Overall: Using Mindflash for both internal and external training allows my company to provide very good training that is clear, informative and easy in-training navigation. Mindflash allowed us to fill a missing piece to selling and properly training customers that need our support installing our products matching our stringent specifications. Using all of Mindflash's features and benefits has made our training the biggest success when launching a new product. Customer support has been the shining star when there is a question or even when we need introduction to numerous Mindflash administrators. We have domestic and international users so having the customer support, multi-language navigation options was very helpful. Recommendations to other buyers: Make sure your training materials are organized before you enter into Mindflash. Mindflash is a great tool when you have great content! Overall: Great online teaching tool, as a trainer for a company that is responsible for training over 700 technicians. When you consider that my tech's are spread out over the entire country (Canada) that is lot of territory to cover. Our training team is small so geographically speaking Mind flash gives us the tool to quickly send out training in a heartbeat. In addition we the tracking and reporting is great. Comments: We've been using Mindflash for over a year now and their product and support is top-notch. Improvements are made seamlessly and when there is a problem, customer support is prompt in responding. The interface is easy to use and intuitive. We've been able to launch and grow our eLearning product over the past year with ease and our customers are happy with the functionality and ability to access our courses from anywhere. I'm looking for more improvement on the reporting side and managing users is getting better. I like the ability to create a quiz and an evaluation within the product. Pros: Ease of use. Great Customer Support. Intuitive for users. Easy to create a course, series and catalog as well as upload content. Great flexibility and choice when it comes to creating a quiz and an evaluation. I like that you can integrate with Shopify for monetizing class offerings. Cons: Advanced reports could be better. I would like to see more ability and ease of creating customer fields. Would like to see a live environment to produce and conduct virtual learning. Pros: Competency questions and the answer review. Cons: I would like archived scoring to show if trainees improved. Overall: I think it is a great software, however, for training I am still looking for some added features: i.e. archived scoring, capturing training that has been completed pre-mindflash into the system etc.. Recommendations to other buyers: One thing Mindflash is good at is listening to their customers. My hope is that there will be changes as feedback get sent to you. Pros: Ease of use, ability to track and segment, types of questions available. Overall: I've been a user for over a year now, and the ease of use is a huge reason why we purchased the service and also expanded. We started with the idea that we would only use Mindflash for the 25 agents in our call center, however we now use it for our home office of 200 people, and also use it with our corporate office which does training for another 250 people. It's been a great value and I would recommend it to anybody needing an LMS system. Recommendations to other buyers: Use the recording software when building classes rather than after. Pros: This is a great option for companies that need to train nationally, especially when dealing with OSHA and DOT requirements. One certified trainer can build the online course and manage training for every employee company wide. Cons: There are still some very minor limitations that are being worked on, but these are few and far between. They are working towards better support for individuals who would like to create courses and accept payment. Overall: Their service is the key to this product. They have a great base, a great team, and are very good at opening up their scope to their customers. While they still have some room to grow, their willingness to listen to their customers and implement based on their needs will surely make them stand out in this industry. They have saved me hundreds of hours and thousands of dollars worth of flying around the company training employees to meet OSHA and DOT regulations. I highly recommend Mindflash. Cons: Would like some additional features like reminders, easier options to upload handouts into courses and some others. Overall: We've had much success with enrolling and tracking our trainees that span multiple states and training needs. Pros: The ability to get up and do a module whenever we need one. Overall: Mind-flash has been invaluable to our company. It has changed the way that we conduct business and cut our cost from a training prospective. Mind flash integrates very well with other software. It is so easy to create mindflash courses when new material is being presented and trained on. Recommendations to other buyers: Over all it is great, it has changed the way we do training forever. Pros: Ease of use for both the trainees, trainers and admins. Cons: Re-certification is still missing. Overall: We've been using this for a year to track certification training. Mindflash has helped to make our employees' lives easier because the training is available in one place and can be access anytime, any where they have Internet connectivity and from any device. 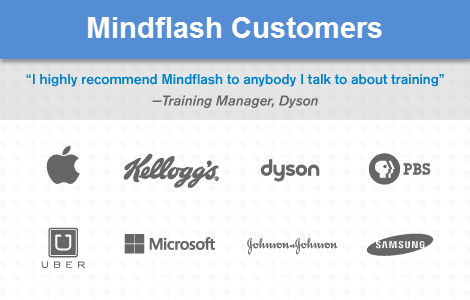 Recommendations to other buyers: Don't hesitate to purchase Mindflash - it's been nothing but a positive experience! Pros: Accessible on the cloud on both computer and mobile device. Cons: Not the most intuitive the first time around creating a course or inviting new trainees. Pros: This LMS was a breath of fresh air after using a big name player for the last few years. The software is simple and easy to administer. We have all the functionality we need and can accomplish all the same tasks we did previously but in less amount of time. Cons: It would be nice if the had a better way to connect with our HRIS and some additional automation. This can all be accomplished through their API but that requires a tech resource we don't have. Comments: Our business relies on a national network of damage appraisers. Remote training is difficult and costly at times, therefore we were needing a way to successfully train close to 1000 people at the same time, spread across the entire U.S. Mindflash has given us the flexibility to train them all without pulling them off the road during the day for live webinars. Pros: Mindflash helps to keep the training more focused. With the ability to assign training to individuals, or entire regions with a few clicks of a mouse is great. The Mindflash reporting capabilities are very good and easy to use. Cons: The tiered pricing structure is frustrating at times. We sometimes need to add more users, but we don't need more features. We end up paying for additional features that we never use. If we need to add one more person above our current tier limit, we have to go to a completely new level and price structure rather than just pay to add a user. Comments: I have put together several Mindflash training sessions and really like it. It is a very easy, simple way of teaching people about a subject, providing a quiz to check their knowledge, and then using the tools to see completion of the training and how people did. It is awesome. Pros: Very easy to use! Great way to train people. Simply make up your PP presentation, upload it, put some audio with it if you want (rehearse as many times as you wish), and send it out to the users you want to do the training. Then, remind them if you need to by resending the link. Also find out how everyone did and who has completed and who hasn't. LOVE IT! Cons: The only thing I have a little difficulty with is when I have audio and have to change the Powerpoint slides around the audio doesn't move so you have to redo the audio. I have not called customer service on this so maybe I am just doing something wrong?? Pros: The ability to record and store training sessions, and to organize them in a course. It makes it really useful and very good for training purposes. Cons: You can't delete users, you just have to archive them. The UI is a little messy. You can only have 1 admin. Overall: It's all about the videos. Mindflash is a really good way to train your company if you can't have regular in person meetings. It saves a lot of time onboarding employees since you can just have them watch videos you previously recorded. Comments: Mindflash is a very effective course delivery tool. We use it mainly to train customers how to use our software. It delivers content in an effective manner, and is easy for end users to navigate. Creating a course is very straightforward and many different types of media can be incorporated into the course design. There are quiz and survey creation and delivery tools, which are useful however require more development to make them truly efficient to use. Although Mindflash excels in course delivery it has several significant limitations when it comes to user management. Although there is fairly good course-to-student relationship management laid out, the student-to-course relationship is very poor at this point and needs significant work. There is no effective way to manage one student and all of their courses at this time. I understand that Mindflash is undertaking a significant overhaul of the software to address the user management issues. I have found their development team to be very open to new ideas and very receptive to customer feedback. I anticipate that the user management side of things will be much better in the near feature. Overall I find this product very useful and would recommend it to anyone looking for a cloud-based training system. Comments: Quality product overall. I would recommend it to a friend. The cost for us is beyond what we can afford. Pros: Ability to integrate or embed multimedia into courses. The reporting is very thorough. Certificate customization is useful. Mindflash is an great system. It has allowed us to improve our training program. Pros: It is user-friendly. We can easily create training that is geared to our own needs. We can update or correct the training as needed. Our staff find the trainings easy to use. Pros: I liked how easy it is to use Mindflash, however I found it to be very basic and at the time we used it, it was flash based and required you downloading an app for mobile use. Comments: Many choices to achieve learning outcomes from people with various learning and computer skills. Easy to set out a course that meets the learning outcomes. Easy to make changes - view etc. before activating course - also making changes after the course has been activated. A course can be developed off-line before uploading into an online course. Tracking trainee participation is easy and time efficient. Distributing the selected course is quick and easy. The communication between trainer and trainee is quick and effective. I rate this on-line training as excellent - our staff are also very confident using it. I have used others and Mindflash is a long way out in front. Okay system, but lacks in many areas where other LMS are ahead of the game. Pros: I liked uploading my excel spreadsheets to the system and having mass invites and reminders sent to users. Cons: There were several things I did not enjoy about this system. The reporting was off when we would run reports on the same things on different days. I also did not like the lack of drop-down options for our users, which made reporting demographics difficult. Above all, it was not a user-friendly system for our users. Many were confused and had difficulties logging in and completing the training. This was the ultimate deal-breaker after being with Mindflash as an organization for just over 3 years. Very user friendly...just open it up and go! Pros: The ease of entering material into it. The quizzes are easy to create and there is a large variety to select. Adding additional material to a course is sooo easy! Maintaining users is simple. It won't let you make a mistake. Cons: No spell check in quizzes. Can't make edits to a particular slide in a course, but edits are made externally and easily replaced in Mindflash. Overall: Attendance of new material delivery and testing for understanding it can now be done online. Being a department of one, it is a huge time saver. Tracking users' activity takes me minutes now instead of hours. We have a lot of annual requirements I need to track and report back to the government and this is allowing me much more time to work on material and not have to monitor end users. What an excellent solution for training for our staff. Pros: Saves tons of money by not having to have so many in person training sessions. Navigation and set up could not be easier. The youtube videos and support are great. Cons: Takes a while for non tech savvy folks to get the hang of. Overall: We implemented a series of training for our HIV/AIDS case managers, about 130 folks, and have standardized training and are able to track it all so smoothly. All the hiccups we had were user errors and we were able to resolve those quickly. Recommendations to other buyers: This was the perfect solution for us and we highly recommend Mindflash to anyone looking for new creative ways to train staff. 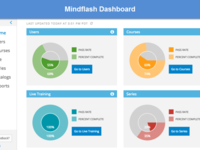 Mindflash, a great entry- to mid-level LMS solution. Comments: A learning management system (LMS) must address the needs of the ultimate end user, our internal and external customers. The LMS selected must have key features that allow users to be actively involved in their training. In the search to determine and compare key benefits and features, we identified industry-leading SaaS LMS providers, and participated in live demos and system trials to create our key features list. This list was used to compare the providers and determine our top three on our short list of providers. Our exclusive goal was finding an easy to use and flexible solution that contained most of the key features on our list. At a minimum, the LMS should have all the necessary on-line course tools for assessment, communication (tracking and reporting) collaboration, and the creation and management of on-line learning courses and program tracks. We completed a feature list comparison and found that Mindflash is our optimal solution provider. Mindflash met the majority of our feature requirements in side by side comparisons. We're thrilled to partner with Mindflash! Pros: Can do just about anything we need when it comes to training. Platform will accommodate both animation & narration, as well as video from multiple sources. Extremely useful. Cons: -Color palette - no reason for the color palette to remain limited to (3) very simple schemes. --Incorrect answers need pop-ups w/ correct/ed info. --Nd to be able to document time spent in a course by trainees. --Quiz labels DO NOT hold enough characters. --Picture upload is limited in size and space, limiting the versatility of this option. Overall: - Some of my update requests are ignored if other users do not share my same idea/opinion. - Quizzing functions need an overhaul, still seems very basic and limited, AND I am not sure if I am using it correctly / efficiently. Some areas of MF have been extremely well explained, while other areas remain as self-taught disciplines, which I think limits users and limits the effectiveness of the final, end-user product. Mindflash has been a gift. Comments: Our company grew from 20 to 60 employees in a few years and face to face training sessions became very time consuming for participants and trainers alike. Many of our courses are repeated annually and must cater for new starters and long serving employees alike. By giving staff this online raining option, Mindflash allows everyone to work at their own pace. This also prevents employee frustration at having to attend a course "to make up the hours". As the course coordinator I rate the ease of sending course invitations, automatic quiz marking, and the results and attendance monitoring and reporting as reason alone to invest in this product. Pros: Easy to update (modular). Intuitive UI. Not a huge learning curve (don't have time for a learning curve). Service is excellent. Cons: Small things-custom certificates is an add-on. Some screen resolution issues with simulations. Can't save recorded audio when all I need to do is replace the slide. Overall: Many. Easy to update and intuitive is most important to me right now. When showcasing the selected tool, others trainers/admin appreciate it's ease-of-use (easier to justify purchase when they see and understand what the program is trying to accomplish). Service is great. If CSM team don't have an answer right away, they will find out for me. They are concerned about my success. Pros: Simple, great options, great reporting. Cons: Been using for 3 months and just keeps getting better as I learn more. Overall: Mindflash is incredible. Honestly, we've used other platforms in the past that were good. But, Mindflash takes the cake. Everything from the simplistic user interface, the real time reporting capabilities, the ability to customize and automate certificates for users (saves a ton of manual labor), and the training tool / arranger / compiler...whatever you want to call it - it's incredible. This is an all in one training system that certainly meets our needs and I am confident it will meet yours. Test it using the free trial period - it will put a smile on your face! Recommendations to other buyers: Try it. Like it. Get it. Pros: Our authors are savvy in the use of Microsoft PowerPoint and with barely an hour's training they were up and running assembling their courses. Our assigned sales/technical contact was (& continues to be) extremely responsive. Our customers have found the offerings to be VERY easy to use and impressive to boot. They love being able to access Mindflash content on mobile devices as well. Cons: I am sitting here trying to think of a negative and I cannot. Working with the Mindflash team and feedback from our users has been a great experience. Comments: We have found that Mindflash is one of the easiest products to use to quickly deploy high quality short courses for our association. It works very well, is flexible and powerful yet simple to design & deploy. In our experience the seamless way Mindflash imports and converts our Powerpoint training slides and then allows us to insert other material between the slides in the converted set is unique and accelerates development and deployment significantly. The quiz options provided give us creative ways to check and reinforce learning and make the experience more enjoyable and engaging - a key factor for us. We could always ask for more in a product but the balance here is just right and gives us a real advantage - any further complexity might just take away its edge. All contact with the Mindflash team has received prompt, professional and helpful responses - a very refreshing experience. In summary, a great product that meets our needs very well, and a great company to deal with. Comments: Mindflash is a superb tool for companies that need to train a large amount of individuals but aren't able to do so in person. I am just in my first year of using the program as an admin/trainer. I designed the course and distributed it globally. It's very easy to create a course and tailor it to your needs. My team is now able to access and educate hundreds of clients that we were unable to reach before. Pros: Easy to create, distribute, and track courses/trainees. Anyone can be trained as long as they have an internet connection. The team that works for Mindflash is very easy to reach and extremely helpful when it comes to questions that come up. Cons: Very few trainees complained about the password strength rules. One trainee was unable to complete a course because she was on an older device, but this is not a huge issue at all. Is easy to learn and intuitive in most of its modules. Cons: A software developer understands very well how to create reports, but for the end user it is not easy, they are quite simple and not detailed reports, the structure of prices / user plans is not very flexible. It has the basic functions of an LMS but can be improved. Comments: Mindflash has revolutionised the way we deliver theory training within our company. We have made a seamless transition from paper based documents to 100% on-line E-Learning modules. Mindflash is one of the easiest systems to use to arrange short courses, build a series towards a certificate of competency, or just to ensure all staff are aware of changes within our business or a client's business. The quiz feature allows imaginative ways to assess staff and reinforce learning objectives. The tracking feature and advanced reports are a key to our operations, they have alleviated the need for copious spreadsheets and administration intervention. We have ten administrators who are actively using the product across Australia and New Zealand. The ease of use meant we didn't have to spend more than one hour in explaining its functions. Over the year (our first year) we have had staff complete 2,500 courses and the system is a great success. Comments: there are a lot of great functions, but it's a basic website, there are areas that could be tweaked, sometimes its confusing coming in as a newbie, but once you get the hang of it, the website admins think it's cute to move things around on you and change things. i get that you want to update your site, but give us a heads up, send out an email. sometimes adding/dropping people can be a hassle, why can't i archive people from the main trainee page?? when i am trying to add a new candidate, and it alerts me that there is a duplicate email, why can't i clear the cells, if i add them to a group, there is a clear all function, but that doesn't work for the first, last and email options, why have a Clear all Button if it doesn't work?? why is there a manage users page and a trainees page?? that is so confusing and redundant. if i'm trying to archive someone i can't see when the modules were sent and i have to toggle back and forth to clear up the list when if they were all on one page, i could just do everything from one darn page! the site does what we need for a basic training module, but overall, there are some big problems. Erica, thanks for taking the time to write a review. Mindflash constantly responds to customer feedback and yes we do make changes to the product. To minimize the disruption it may cause, we send email and in-product notifications about webinars and demos before any major changes. It looks like we aren't meeting your workflow needs. We will follow up to learn more and see how we can improve the flow for you so that we can make your life easier. Comments: I've been in the learning and development for over 20 years and am now at a new company. This new company, until my arrival did not have an e-learning strategy. With Mindflash we now have a path to deliver just-in-time flexible training for our company. 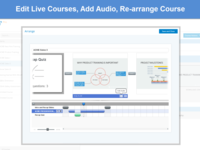 I've worked with high-end multimedia learning development tools in the past and Mindflash offers a new user/trainer a way to build an online cirriculum quickly and easily! It is easy to learn and even easier to use! There are a currently a few limitations - like being able to extract needed content, like existing courses for review and update, extracting trainee list in to a spreadsheet, extracting "missed" questions on a quiz. Also, would love to see the ability to track "attempts" on a quiz. 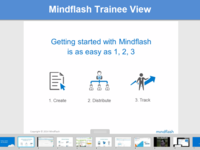 Overall, I think the mindflash application is extremely useful and we have built a great set of online training modules for our internal teams. Thank you Mindflash - keep the updates coming!! Comments: I love Mindflash for any department that needs to build quick training programs with few resources. Mindflash is ideal for any company that doesn't have extensive learning and development resources. My instructional designer on my last team didn't like Mindflash because there were a number of things that could not be done using the platform. For me, the pros outweighed the cons. I tend to join companies where my org runs very lean, with a product line that has a weekly release cycle, and heavily relies on subject matter experts. With this tool, all of my SMES can become e-learning authors, I can prevent my materials from being out of date, and at a cost that I feel is very reasonable. There are some bells and whistles that some of the larger tools have that I would love to have, but I'll choose a lean, uncomplicated tool that just works any day over bells & whistles. Pros: Awesome features, progress charts, voice-over options, dynamic quiz options, variety of formatting options for different training styles and modules. Cons: This system doesn't currently sync with our HRIS system (Paylocity) but the features are worth it for the ease of use and customization. 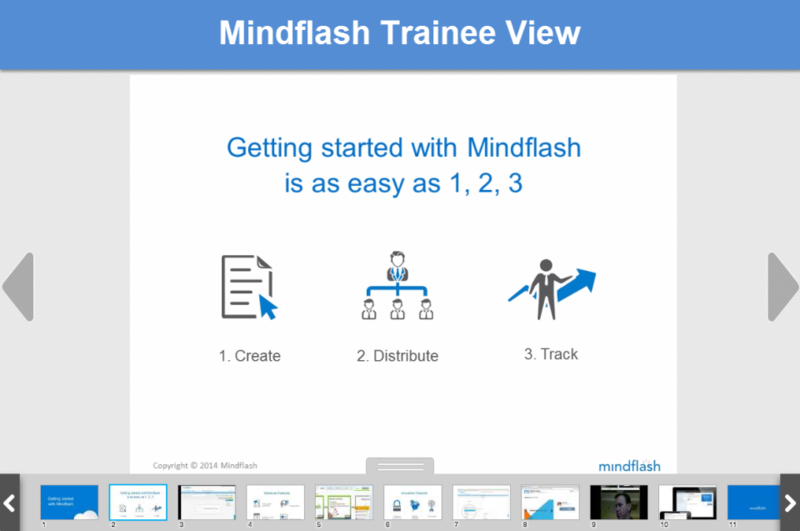 Comments: We began using Mindflash for both internal and external training in July '15. The customer support is exceptional, the team is flexible and open to suggestions for improvement. Super simple to upload, edit and distribute educational modules and the back end tracking is quite comprehensive. Pros: Love the ease of use and module editing capabilities as well as the range of formats that can be utilized in the trainings we upload. *No templates. Having some easy to use templates would be a great help, most managers who use the software aren't graphic designers, or have experience making videos. When this idea was first pitched to our business by a supervisor, I was very skeptical. Our company was expanding remotely, and we were having issues training everyone on a macro level. The idea of robotraining via Mindflash came up, and I was very skeptical. I'm happy to say that I was wrong, and the size of our remote branch has tripled since Mindflash was incepted. Thank you very much for the great product, one we will be using for many years. Comments: The Mindflash platform has served it's purpose quite well, and for the value, it's superb. Although we have not used Mindflash to create Learning & Training Courses, it's built-in tools will get you up and running quickly. Pros: Simple to use, with a little background. Handles the load, lots of courses "up there", lots of uses accessing. Cons: None, we are happy campers. Comments: I have used Mindflash for my organization for sales training. It has been easy to use on the admin side as well as the end user side . It allows me to reach our reps and keep them up to date as well as our customers for additional information for their sales people. Pros: creating a new profile is very easy to do. Cons: Only Con I have is that I am not able to deleted someone totally out of the program. I have to repurpose the profile. Comments: It is a really good training platform, really easy to use, i like the customer service and they are always there to help you out, for our company it works perfectly because we have a bunch of different locations and we dont need to travel anymore for the process training. Pros: the trainees can use it on their cellphone or tablet , as well we can add as much of courses as we need. Comments: Mindflash provided the perfect solution for training individuals within our integrated justice system. Before Mindflash, new hires were trained individually. The trainer was typically a person who had done the job in the past and there was very little consistency and direction in the training. Mindflash not only standardized the training but also allows the new hire to proceed through the training at their own pace. Mindflash also provides tool for checking progress of training and provides feedback on knowledge retention through quizes and surveys. Residual training is a snap with Mindflash as well. When a new process is created or an existing process is changed, Mindflash provides a means of documenting and distributing the information to all users in a consistent format. Comments: I appreciate the simplicity of MindFlash, though the set up was an incredibly manual process. Here are the pros and cons as I experience the product. All in all, this is the best LMS I have personally used. And despite the limitations, I'm confident many improvements on my list will be made in the coming year. Any data you create during your trial can be included in your production environment. The interface is clean and uncomplicated. No extraneous bells and whistles. It is compatible with SCORM producing software such as Captivate. Easy on the budget. The ROI is amazing. They listen to your suggestions and try to incorporate them. Adding voice overs to a slide has to be done in a perfect take. Might not integrate with your existing HRMS. It might not handle PowerPoint animations well. You can't re-order slides within a presentation once they're uploaded. Comments: It's really easy to use and I've set up several courses in it. It's also very useful in tracking course completion and time of course for each employee. Usually I create page designs in another program, and they're easy to plug into Mindflash from there. I'm in the travel business and it involves about 120 employees in all that use training from me. Pros: Ease of use, flexibility, good quiz and survey tracking options. Cons: Not intuitive where to find some specific functions at first glance. Comments: We use the sight to reach out to over 500 people to be trained in the Management of Disciplinary hearings at local football level. Mindflash has been a fantastic asset in assisting The FA in the development of skill sets of our volunteer workforce. Its ease of use is key and friendly UI is particularly important where some users are not familiar with the use of technology and training platforms. Simply assessments have been developed to confirm the users understanding of the training and ensures the business provides a service that is fit for purpose. Simple, effective and easy to use and I would recommend anyone considering looking at a training platform to have a look at Mindflash as a possible solution. 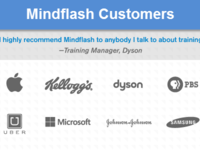 Comments: MindFlash has been a great product that has been able to accommodate all of our training needs. Many departments use this portal, ranging from HR to Sales. It has a clean interface that is fairly easy to navigate. Some items are a little more tedious to work through, it would be nice to have more options in managing users and inviting existing trainees to multiple courses at a time. MindFlash's customer service is extremely prompt and reliable. All suggestions made are promptly addressed and in most cases, changes are made. I would like to see more advanced reporting options, as well. Such as drawing a report for individual trainees and all the courses they are invited too with their progress on it. The reporting now is limited.